15 minutes by metro.It is only 30 minutes form Shenzhen Air Port by bus. • From Shenzhen railway station: Take Metro Line 1. Getoff at the Exhibition Center stop. Over a dozen bus routes run along side SZCEC, includinglines 15, 34, 35, 38, 50, 56, 63, 64, 71, 76, 80, 109, K113, 214, 221, 229,235, 337, 353, 374, 375, 382 and 391. Getting to Shenzhen from downtown Hong Kong is simple, as it takes less than an hour on a KCR train. The KCR train connects East Tsim Sha Tsui to Lo Wu and Lok Ma Chau with several intermediate stops. It interchanges with the urban section of the MTR at Kowloon Tong Station and East Tsim Sha Tsui Terminal. The journey from East Tsim Sha Tsui to Lo Wu or Lok Ma Chau takes 40-60 minutes and costs HK$33-36.50, first class is charged double. Trains depart every few minutes but some short trips are operated in rush hour, so check the destination screen before boarding. The train can be crowed during rush hours as it serves millions of commuters along the line as well. After you go through the immigration at Lo Wu or Lok Ma Chau, you can take the Shenzhen Metro (Line 1 at Lo Wu costing RMB 4, and Line 4 at Lok Ma Chau costing RMB 2) to the fairground whose station name is Huizhan Zhongxin (Shenzhen Convention & Exhibition Center). Of course, you can take a taxi. It costs around RMB 30 from Lo Wu, and less than RMB 20 from Lok Ma Chau). There are very frequent bus services that can take you from the Hong Kong downtown to Huanggang border. You can take such buses in Mong Kok, Prince Edward, Jordon, Kwun Tong. The journey takes 40-60 minutes, costs around HKD 30-40. Services hours are 0:00-24:00. 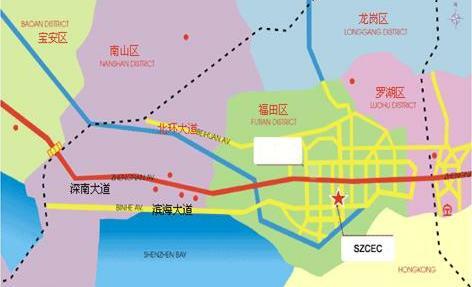 Shenzhen Bao’an International Airport is 32km form downtown. We highly recommended you to take metro to fairground.